In previous experiments that simulated conditions on primordial volcanic islands, we demonstrated the abiotic formation of hydrophobic porphyrins. The present study focused on the question whether such porphyrins can be metalated by prebiotically plausible metal ion sources. We used water-insoluble octaethylporphyrin (H2oep) as a model compound. Experiments were conducted in a nitrogen atmosphere under cyclic wet–dry conditions in order to simulate the fluctuating environment in prebiotic rock pools. Wetting–drying proved to be a crucial factor. Significant yields of the metalloporphyrins (20–78% with respect to H2oep) were obtained from the soluble salts MCl2 (M = Mg, Fe, Co, Ni and Cu) in freshwater. Even almost insoluble minerals and rocks metalated the porphyrin. Basalt (an iron source, 11% yield), synthetic jaipurite (CoS, 33%) and synthetic covellite (CuS, 57%) were most efficient. Basalt, magnetite and FeCl2 gave considerably higher yields in artificial seawater than in freshwater. From iron sources, the highest yields, however, were obtained in an acidic medium (hydrochloric acid with an initial pH of 2.1). Under these conditions, iron meteorites also metalated the porphyrin. Acidic conditions were considered because they are known to occur during eruptions on volcanic islands. Octaethylporphyrinatomagnesium(II) did not form in acidic medium and was unstable towards dissolved Fe2+. It is therefore questionable whether magnesium porphyrins, i.e. possible ancestors of chlorophyll, could have accumulated in primordial rock pools. However, abiotically formed ancestors of the modern cofactors heme (Fe), B12 (Co), and F430 (Ni) may have been available to hypothetical protometabolisms and early organisms. 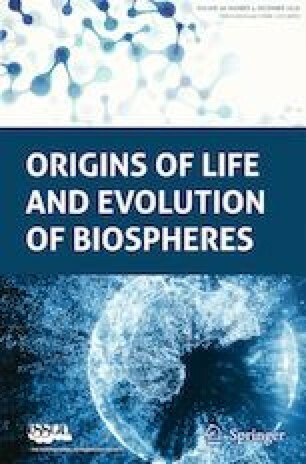 This paper is based on a poster of the same title presented at the 15th European Workshop on Astrobiology (EANA 2015), held 6–9 October 2015 in Noordwijk, The Netherlands. The authors are grateful to Thomas Staudacher (Observatoire volcanologique du Piton de la Fournaise, La Réunion) for assistance with sampling of the basalt and to Dr. Manfred Martin (Regierungspräsidium Freiburg; Landesamt für Geologie, Rohstoffe und Bergbau) for the basalt analysis. We also thank Dr. Beda Hofmann (Naturhistorisches Museum Bern) for the meteorite samples and Dr. Igor Puchtel (University of Maryland, College Park) for the komatiite. Special thanks are due to Prof. Wolfgang Hanke and Prof. Wolfgang Schwack (both at the Universität Hohenheim, Stuttgart) who provided the fluorescence microscopy and HPTLC equipment, respectively, and helped us with the measurements. We are also grateful to Dr. Frank Trixler (Deutsches Museum, München; School of Education, Technische Universität München; Center for NanoScience (CeNS), Ludwig-Maximilians-Universität München) who provided HLP the opportunity to perform AFM measurements during a research stay in Munich. We thank Sonja Ringer for technical assistance. HLP thanks the State of Baden-Württemberg for an LGFG doctoral fellowship.